General Chemistry is a required course in the chemistry, biology, biochemistry, and neuroscience majors. It is also required of pre-medical, pre- dental, and pre-veterinary students, so most first year students with these academic and/or professional interests enroll in this introductory course. Student success in introductory chemistry depends primarily on two things, skills and commitment. The latter is up to you, but we can help you with the former. 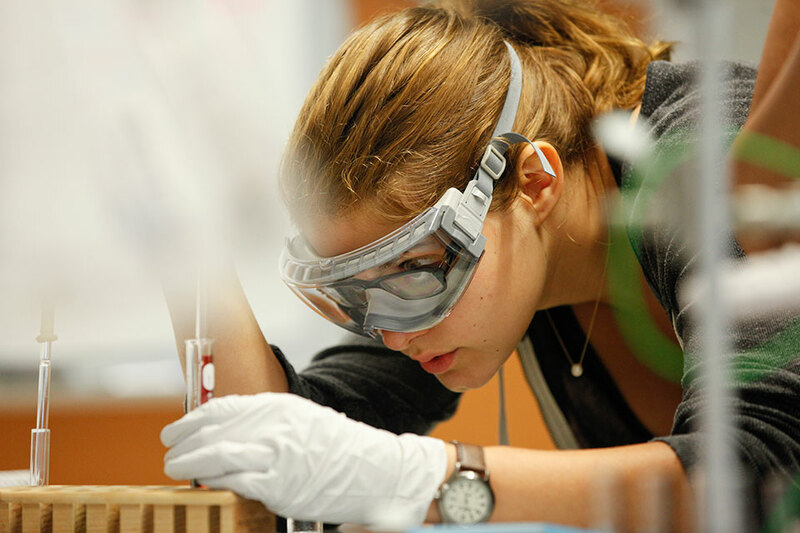 Because students enter college with varying problem-solving skills from their high school experiences, different introductory chemistry sequences are offered at Brandeis University. The course for students with one year or less of high school chemistry is CHEM 11 (General Chemistry). CHEM 11 assumes successful math preparation through pre-calculus, and is taken by about 3/4 of the students in introductory chemistry. CHEM 11 requires fluency working with algebraic expressions, exponential terms, and logarithms. Students who have not taken pre-calculus are strongly advised to take MATH 5 in their first (or second) semester at Brandeis, and postpone taking General Chemistry until their second year. 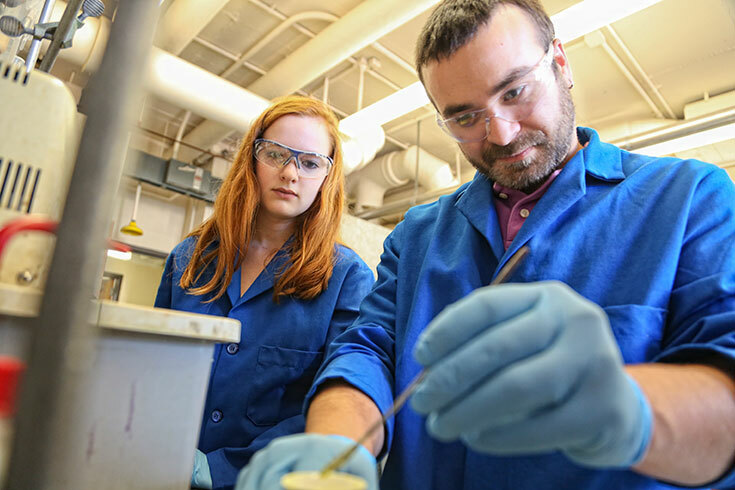 For students with stronger preparation and/or considering a major in chemistry, chemical biology or biochemistry, we offer CHEM 15 (Honors General Chemistry). CHEM 15 assumes some basic chemistry and math preparation and explores advanced topics relevant to chemical science majors. It is the course of choice for students with two years of high school chemistry or a successful year of high school chemistry with AP chemistry (3-5) or AP physics or AP calculus. CHEM 11 has four afternoon recitation sections as well as a mandatory session on Wednesday evenings. Attendance at one afternoon session is a requirement of the course, but many students find it helpful to have the time available to attend more than one recitation per week. CHEM 15 has a mandatory Wednesday evening session, but no additional recitation requirements. If you are uncomfortable with math (see below)*, consider postponing introductory chemistry until you have successfully completed Math 5a, especially if you have not previously had a successful year of high school chemistry or physics. Remember, taking the course successfully is more important than taking it early!. If you have had two years of high school chemistry or a successful year of high school chemistry and/or have done well in AP chemistry (3-5) or AP physics or AP calculus, then you should enroll in CHEM 15a and the associated laboratory CHEM 19a. Students with AP (4 or 5), IB Chemistry (score 5 or greater), or UK-type A-level exam (A, B, or C grade) may take Organic Chemistry Lecture and Laboratory courses (CHEM 25a and CHEM 29a). Organic chemistry focuses on the structure and reactivity of carbon-based molecules, and has direct implications in a variety of fields including biology and biochemistry. These courses are required for most science-related undergraduate programs as well as application to many graduate programs. Taking organic chemistry in your first year allows more time in subsequent years to take advanced courses and carry out research. Note: students electing to take AP credit for first-year chemistry must begin their chemistry career at Brandeis University with CHEM 25a. Most students who begin their studies with CHEM 25/29 receive grades in these courses in the A to B-minus range, with AP 4 students performing at levels slightly below those of AP 5 students. IF YOU DO NOT HAVE AP 4, AP 5, an IB score of 5 or greater, or advanced A-level status, you may not begin with CHEM 25/29 and must take CHEM 11/18 or CHEM15/19 first. If none of the above situations applies to you, then you should enroll in CHEM 11a and the associated laboratory CHEM 18a. Visit the Registrar’s website for further information and an exercise to determine your math preparation for CHEM 11a/15.